2018 YOUTH FX SUMMER Re-CAP! Youth FX at Albany High is a full year after school program that has been integrated into the Performance Studies Program at Albany High School. Students can register for the class and earn an arts elective credit or they can take part in it as an after school club. Unless you are taking the program for a credit we are a drop-in program and students are welcome to join anytime. 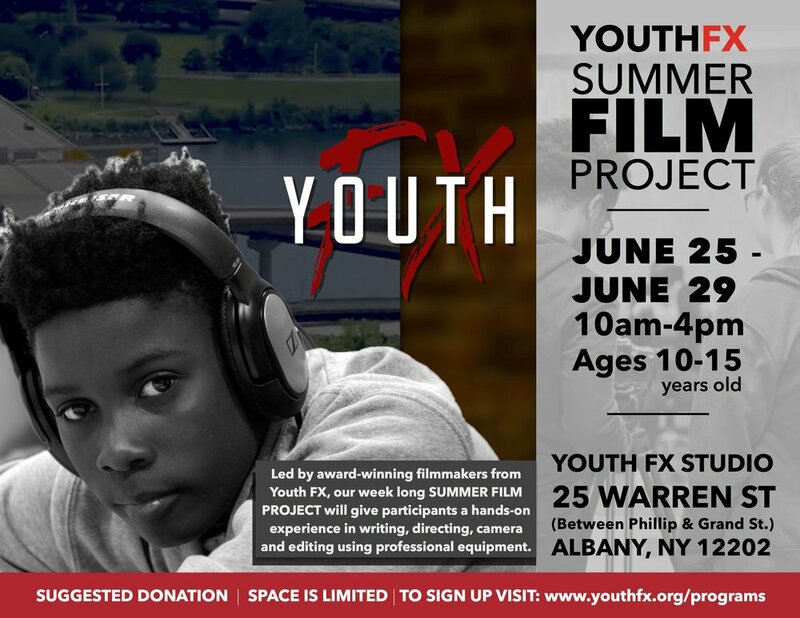 Our 5 Week Youth FX Summer Intensive is a program for young people in the City of Albany who are interested in pursuing a career in film - with a focus on directing, cinematography, acting, screenwriting, editing, sound & lighting and all of the above. The program includes hands-on technical workshops, film screenings, analysis of film theory an history and presenting filmmakers from around the country. This year's presenting filmmakers include: Nijla Mumin (Jinn, Queen Sugar), Khalik Allah (Black Mother, Lemonade) and Rosa Clemente (PR On The Map). The last three weeks of the program is production based with students getting into groups and writing, casting, directing, shooting and producing up to 6 short films. Youth FX Summer Intensive is limited to 25 students and is FREE for young people who live in the City of Albany. Follow our Youth FX INSTAGRAM page for daily updates from our summer intensive! The Youth FX Summer Intensive is led by our staff of award-winning filmmakers and educators and emphasizes a production based approach to teaching filmmaking that is informed by hands-on workshops, community building, screenings, discussions of the history and aesthetics of film. We also invite presenting filmmakers to screen work and engage in deep discussions with students about their work and their careers paths as working artists. Led by award-winning filmmakers from Youth FX, our week long SUMMER FILM PROJECT will give participants a hands-on experience in writing, directing, camera and editing using professional equipment. There is a suggested donation of $100 per student for the week, but no one will be turned away for financial reasons. Please email: info@youthfx.org with any questions or to get on the wait list for the program.